Col de Larche reaches almost 2000 meters, but unlike other passes at this elevation, the road does not have to engage in the same civil engineering acrobatics. You can already see from any map that two relatively gentle valleys meet at the top. A historic thoroughfare between Italy and France is the result. One website directed at cyclists advises to cross this pass from west to east. I just happened to do the opposite. So here is the description of the not recommended crossing. From East. The description starts some distance before the elevation profile. S21 going up the Stura valley from Burgo San Dalmazzo is pretty narrow and has a lot of traffic. But the signed bike route is a much better option. The signed "Itinerario Stura Valley" route starts just before S21 crosses the river and leads on continues for its entire length on the opposite side of the river. This narrow road looks just like a bike path most of the time. But it's a road - and you do encounter a few cars on it. Benches for lunch stops are rare in this part of Europe, but there's at least one on this route in Fetiona. Past Demonte the views of villages on the opposite side get more interestion. West of Vinadio it's easy to confuse the Stura Valley route with the road up Colle di Lombarda. Instead the Itinerario Stura Valley route towards Col de Larche keeps on heading for the same peaks that have been in the field of view for the last several miles. The bike route soon ends after this crossing. But during my ride in early June, I didn't encounter much traffic at this point on the road either. A long tunnel past Sambuco marks a scenic transition. Below are the high limestone walls of the Stura Valley. Above the landscape looks more like a high alpine valley. The villages here are resort towns, but don't look overly commercialized. Past Argenterra, it appears like 8 or 10 gentle switchbacks lead to the top of the pass. But once up there, there is a second set. Then the valley levels out above treeline, passes a lake with restaurant still on the Italian side and the road climbs a gentle saddle. The top contains a parking lot and at least one large building. An internet page mentions a nearby monument to cyclist Fausto Coppi. I didn't see it. Maybe you have to search the distant corners of the large parking lot. From West. (described downwards). The French side is drier and the resulting mountain vistas have quite a bit more grandeur than on the Italian side. If the light deteriorates in the afternoon, you see much more of it if you ascend on this side. This is reason why a west to east ride may be better. Past the town Larche the views of high mountain peaks give way to a deep gorge. This is the only portion where the road requires switch backs. 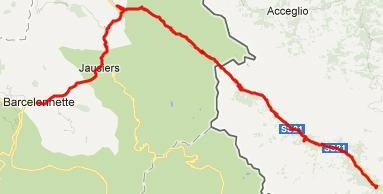 Past that the road merges with the descend from Col du Vars and then follows a canyon into the Ubaye valley past la Condamine to Jausiers and Barcelonnette. This is a natural border crossing between France and Italy, and since conditions have not always been as peaceful as they are now, the pass was of great military interest. It is speculated that it was used already by Hannibal in 218 to cross the alps. In 1515 a French army under Francis the 1st used the pass to attack Italy. Prior to this Col de Larche (then called Col de l'Argentierre) was used primarily only by goat herders. During the war of Austrian Succession, the first considerable defense structures on a perfect vantage point, overlooking the now (French) approach of Col du Larche were built. The side was chosen to guard against Austrian and Piedmontese attacks. Eventually this became the site of Fort Tournoux, a spectacularly located mountain fort, as part of the Little Maginot Line of WW2. Eventually it was taken by Germans and remained a last pocket of resistance, long after Provence had been taken back by the Allies.